Helping our senior residents stay active and healthy is one of our priorities at PeachTree Place Assisted Living Community. You or your loved one will enjoy our exercise programs, fitness classes, and exciting outings in Ogden, West Haven, and the surrounding areas. Our community activities are specially designed to help you maintain your health and independence while having fun with your friends. Strengthen your heart and keep your mind active with our daily exercise routines. 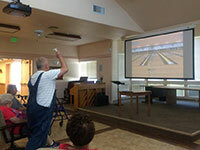 Our activities are designed specifically to help our elderly residents stay fit. Low impact exercises like walking, yoga, and simple stretching will assist in improving cardio health, muscle tone, and stress reduction. Enjoy the sunset years of your life by staying fit and getting out to do the things you love. Strengthening your arms, legs, and core muscles are crucial to being able to perform the everyday routines you enjoy, and we offer a variety of opportunities to help our elderly community members stay mobile and active. 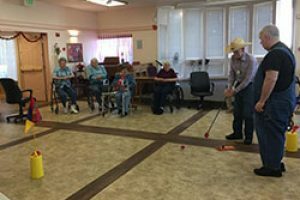 From Sassy Sittersize to daily walks and Wii Bowling, we have designed fun community exercises for the elderly that our residents love. We also take weekly trips and outings to concerts, sporting events and some of the Ogden’s best restaurants and entertainment venues. Staying active with other seniors is an important part of your physical and overall senior health. It is easier to exercise and stay motivated with your friends. Because of this we have designed fun community fitness opportunities and enjoyable trips to Ogden and West Haven. Our residents find happiness working out in a group or taking a class with peers. Our fitness team and activity coordinators incorporate elements of humor, music and entertainment into everything we do at PeachTree Place Assisted Living Community. If you are considering independent senior living options in Ogden and West Haven, schedule a personalized tour of PeachTree Place Assisted Living Community. 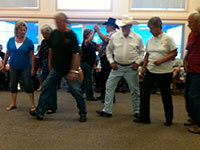 Sit in on our senior exercise classes or join one of our off-site trips. You will see firsthand how enjoyable our senior fitness programs and community activities are, and you will bond with new friends who share similar interests. 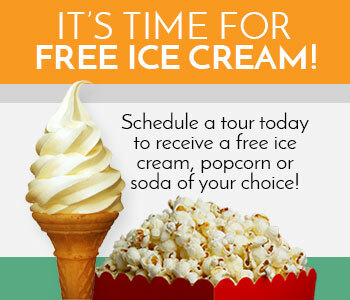 Call us today to plan your visit or request an appointment online.